Coding – Decoding Reasoning Short Tricks, Questions with Solutions: Coding – Decoding is that part of Reasoning in which any word, Number or Alphabet is coded in a special way secret messages or words have to be decoded. They are coded in a definite pattern or rule which you should have to identify first. Coding is the process in which a meaningful word / alphabet change in a meaningless words / alphabet pairs / Numbers according to a certain rule. Decoding is the reverse Process of Coding means Decoding is the process in which a meaningless words / alphabet pairs / Numbers change in a meaningful word / alphabet by the same rule by which it is coded. To understand this type of Question you have to find out the code pattern. Example 3: The word DIAGRAM is coded as AFXDOXJ. What should be the code letters of PICTURE? Example 4: The word ABLE is coded as 5324 and BINGO is written as 36178. Then, How is BANGLE written in that code? 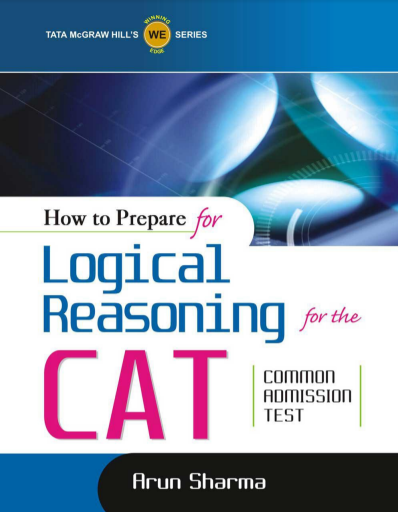 Example 5: The word CAT is coded as 24 and SAD is written as 24. Then, How is SHE written in that code? Example 5: If “SKY” is called “WHITE”, “WHITE” is called “AIR”, “AIR” is called “BLUE”, “BLUE” is called “WATER” and “WATER” is called “LIGHT”. Then, Where will the Bird fly? Solution : Generally, Birds fly in the Air, and According to Question AIR is BLUE then BRIDS will Fly in Blue. In this type of Questions, Three or more sentence will be given in Coded language and code of a particular Word will we asked. Example 6: In a certain code language, ‘give your book’ means ‘sk dg ap’ ‘book my tickets’ means ‘dg le nb’. Which word in that language means ‘give’? 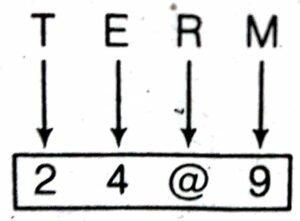 In this type of Questions words/letters are coded by special symbols. 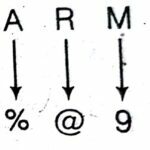 Example 7: In a certain code language, ‘BASKET’ is written as 5%3#42 and ARM is written as %@9. Then, How is TERM written in that code?